Sometimes there are stories from the NBA that are so bizarre that you have to read through them a couple of times to make sure that you read them correctly. There are so many important stories at this time of year, players signing for new clubs, preseason games being announced and TV rights being negotiated that sometimes you can feel as though basketball is 100% serious all the time. We’re still a good bit away from the first game of the 2014/15 season and already some fans are working themselves up into a fever pitch about what is on offer. This is where it can be good to look at some of the funnier stories. There has been a lot of talk of late of NBA players deciding to go abroad for a number of years. This is down to the fact that there is a lot of money to be earned through playing basketball abroad. The Far East has lured a few players (this and this article) in recent times and while these players will never be considered as being at the top of their game in the NBA, it is likely that they will be able to impact on games in their new country. Whether the players have solely moved for the money or because they know they can no longer impact on NBA is something that only they will know but there is no doubt that these elements will be involved in the overall decision. One player who has given up on the NBA, and basketball itself, is Darko Milicic. The player was the number two pick in the 2003 NBA Draft but it seems as the centre has had more than enough of basketball in his lifetime. This is because Serbian news stories have announced that the former player is now a professional kickboxer in Serbia. As a 29 year old who no doubt still has a high level of fitness in him, this may seem a surprising move, and it is even more shocking when you think back to his entry to the NBA. He arrived with a great deal of hype and he was only beaten out in the draft by LeBron James. Milicic was selected ahead of players like Chris Bosh, Carmelo Anthony and Dwyane Wade, which is an illustrious set of characters. Sadly though, Milicic wasn’t able to live up to the height and over his time in the NBA, he only managed a career average of 6 points per game and 4.2 rebounds. He had two years with Detroit, was traded to Orlando and then signed for Memphis as a free agent prior to the beginning of the 2007/08 season. Before the start of the 2009/10 season, he made his way to the Knicks and was then off to Minnesota. His time at Minnesota was probably his best, staying around for two years and averaging an average of 8.8 points a game in 2010/11 but he was waived soon after. He made his way to Boston to sign for the Celtics but only managed one game before he was waived again. He may no longer be able to feature in basketball betting but when it comes to kickboxing betting, this is one man you need to look out for! This may have been a strange story but the story that has recently got basketball fans laughing on Twitter surrounds the new arena for the Golden State Warriors. 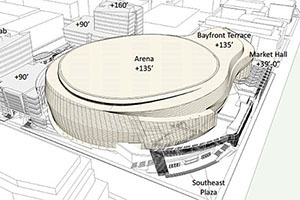 We are only at the architectural rendering stage but it has to be said that the design for the new 18,000 capacity arena looks like a toilet. As you can imagine, the jokes have been coming thick and fast, with Warriors fans at the brunt of it. A spokesperson for the team has announced that they are actively seeking feedback as part of the creative process, and if they are, they will find that there is not a lot of support for the arena in the current shape or form. If the Warriors fans have their way, the design will be getting changed quickly!